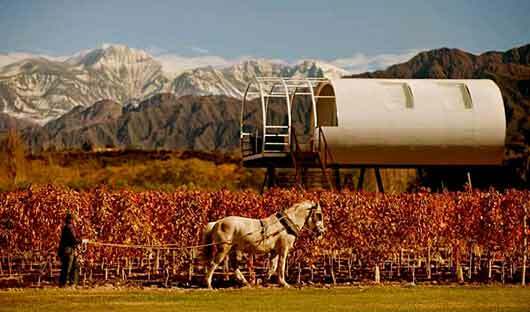 Nestled at the base of the magnificent Andes mountain range is the luxurious Entre Cielos Wine Hotel & Spa. 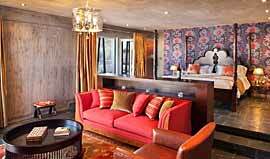 We’ve chosen this beautiful award-winning hotel as the centrepiece of our 3 night Gourmet Mendoza winery experience. During your stay you will not only discover some of Argentina’s most famous wineries and sample their best wines, but you will also have the opportunity to unwind, enjoy great food and sample the best of Argentinean hospitality. 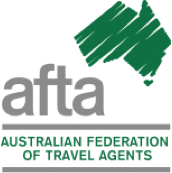 If you enjoy wine and the relaxed lifestyle, this is a very special experience. Alternatively you can combine two beautiful properties in a 4 night gourmet journey which includes 2 nights at Entre Cielos Wine Hotel & Spa and 2 nights at the family-run Finca La Azul in the Uco Valley. 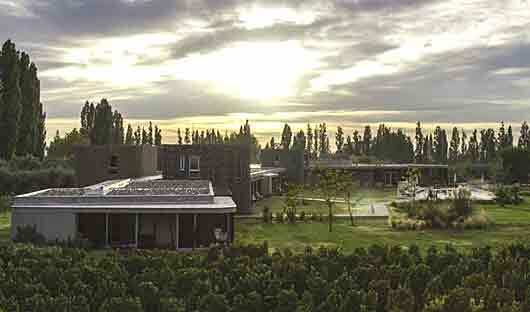 Upon arrival you are transferred to the Entre Cielos Wine Hotel & Spa located 20 minutes from Mendoza’s city centre. In the afternoon you will visit the award-winning Achaval Ferrer winery. Here you can taste wines produced at the different altitude vineyards and explore the concept of ‘terroir’, the environmental conditions that give a wine its unique flavour and aroma. Dinner tonight is at ’1884′, the restaurant of renowned Argentinean chef, Francis Mallmann. Located in an old winery it is considered one of Mendoza’s finest restaurants. Inspired by the outstanding natural beauty of the region, Entre Cielos lies in the foothills of the spectacular Andes, surrounded by vineyards that produce the world’s finest Malbec wines. 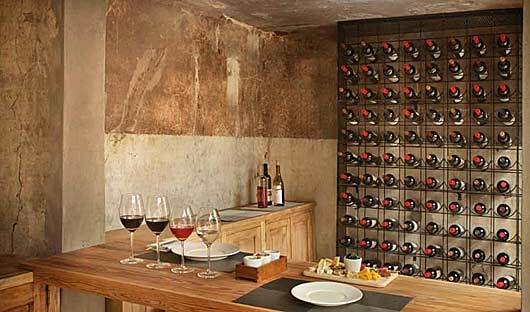 All aspects of this extraordinary luxury wine hotel, with 15 stylish rooms (named after different styles of wine – Classic, Gran Reserva, Gran Cru …) and the ‘Limited Edition’ vineyard loft, combine to blend the principles of harmony and adventure that define this frontier of wine-making. Design and architecture, gourmet experiences, the authentic hammam and spa, plus Mendoza’s great outdoors, all come together perfectly to achieve ‘Viviendo la Vida’, or ‘enjoying life through all the senses’. 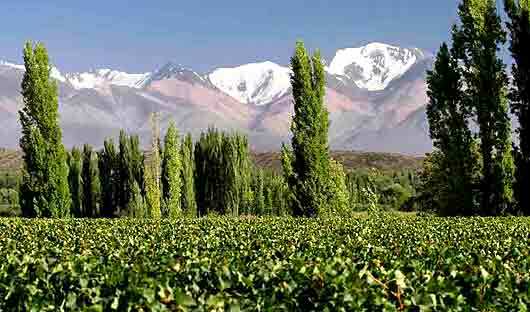 Mendoza is the birthplace of Argentina’s winemaking tradition, begun by Italian and Spanish immigrants. 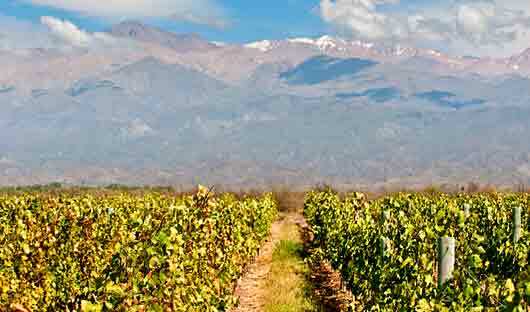 Today visit the historic Catena Zapata winery, a pioneer of quality winemaking in Argentina. Tasting continues at Belasco de Baquedano, renowned for its ‘Hall of Aromas’. Lunch will be at the Ruca Malen winery where each of your five courses is paired perfectly with just the right wine. After lunch return to Entre Cielos where you can enjoy the outdoor swimming pool or relax in the hotel’s amazing hamman. This morning travel south to the higher grounds of the Uco Valley where unparalleled soil and climate conditions have earned this area its world-class reputation. You will visit the Monteviejo and Diamandes wineries and later relax over lunch at La Azul, a small boutique winery in the foothills of the Andes. Return to Entre Cielos. After breakfast, visit a traditional producer of extra virgin olive oil where you will learn the secrets of the pressing and decanting process. This is followed by time at leisure to wander through Mendoza’s historic sites and elegant parks before transferring to the airport or bus station for your next destination.